ES BILLETE SALIO PARA CELEBRAR EL NATALICIO DE RAFAEL URDANETA, DURO POCO EN LA CALLE Y NO SALIERON MUCHAS EMISIONES…! Ese billete me impacto mucho, sobre todo de niño por la escena del combate naval, los barquitos, etc. era mucho dinero que alcanzaba para comprar un surtido amplio de chucherias. 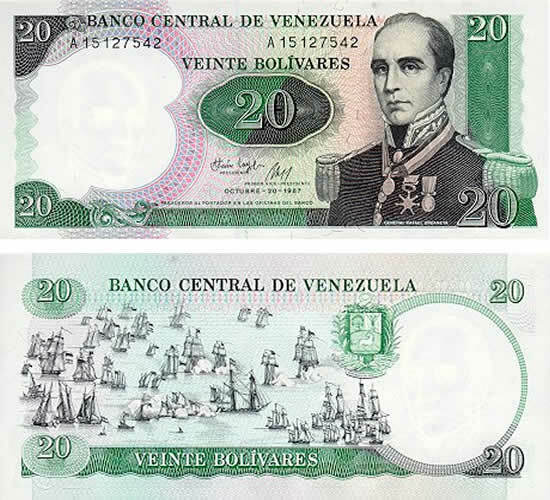 sin duda uno de los billetes mas hermosos del siglo 20 venezolano. Ustedes no recuerdan el “truquito” de este billete? el que decia que los Copeyanos, y me perdonan las groserias, le estaban “metiendo la pala” a los Adecos? solo tenian que doblar el billete de derecha a izquierda hasta casi tapar el 20, y de repente tienes un pene VERDE apuntando a un trasero BLANCO!!! siiiiiiiiiiiiiiiiiiiii jajajajajajajajajaja claaaaro que recuerdo ese chiste del billetico. por eso lo sacaron de circulacion… creo. Este es un ejemplar muy bonito y no es tan antiguo, sin embargo son pocas las personas curiosas que los gusrdan, como dijeron anteriormente es un ejemplar de colección. mi esposa tiene uno y tambien de 2 bolos, yo tengo de los demas casi todos jeje!!! This post appears to get a great deal of visitors. How do you advertise it? It offers a nice unique twist on things. I guess having something real or substantial to talk about is the most important thing. I would like to thankx for the efforts you have contributed in writing this blogpost. I am hoping the same high-grade work from you in the future as well. In fact your creative writing abilities has inspired me to get my own blog now. Really the blogging is spreading its wings quickly. Your write up is a fine example of it. delivers the reality of the issue. Thanks for your insight, i love to read views that make sense and are effective in nature. Took me time to read all the comments, but I absolutely got a lot out of your post. It turned out to be very educational to me and I am certain to all the commenters here! It’s always nice when you can not only be taught, but also entertained! I’m sure you had fun putting together this post. There is certainly a lot to know about this. I believe you have made some good points in Features also. Hey, awesome site. I came across this on Google, and I am extremely happy that I did. I will definately be coming back here more regularly. Wish I could add to the info and bring a bit more to the post, but am just reading as much info as I can at the moment. Certainly not the fastest web site to load but I’m happy I waited. Having searched almost all of the evening for this material I finally found it on your website. One pleased reader here! I really enjoyed reading your article! I found it not only informational but entertaining also! I am mainly involed with Web Host Cost but I really learned a lot from this. Keep up the good work!